Normal people rarely use desktop to chat though. If a chat app which do not support mobile, for me it’s NOT even an app. It’s something else. Thank you for your reply @muneeb. I know you aren’t doing an easy job, and I do believe you all are giving it your honest best. Have we achieved product market fit? Could we have done better? More clearly defined our target audience, is this a useful unit of functionality or is more needed for adoption? etc… of course there are 1000 things that we could be improving. we would be supported in a way that would enable us to sustain development, either by investment or other funding. This is the implicit promise I heard in the initial blockstack signature fund announcement https://www.youtube.com/watch?v=vQSbqwz4TPM&t=77s and one of the big reasons I chose to build on blockstack. I’m not saying they don’t deserve the success they are having. They’re focusing on a different use-case first, high-security individual wealth storage. We are focusing on shared-ownership. They charge $10.000 a year from high net-worth individuals. With Misthos it is possible to setup an equally secure multi-sig wallet where 1 individual owns all the keys for for free. Anyway… I’m getting side tracked. My point is after 1 year of self-financing I’ve now gone back to spending my time with things that earn money as I must support my family. I don’t have time to engage in this community and I don’t see how opening a ‘Stacks Improvement Proposal’ will have any substantial effect on our situation. Besides I don’t think my lack of engagement, given the time and money investments we made is the reason we haven’t achieved a situation that is sustainable. In the end I take full responsibility for leading the Misthos project the way I did. Obviously it would have been cool if things had turned out another way, but a bunch of mistakes were made (including relying too heavily on promises made by blockstack) that meant we didn’t achieve what we wanted to achieve. Wether or not the current state of things as to how you are distributing money is a success or not is not for me to decide, or fix. Thats on you. Due to time and financial constraints in my life I’ve voted by exit (at least for now). I love this line. We - Asians have an idiom “Blame yourself first,…” - respect! Good to see this discussion going on here as I figured these issues in the last run and for this run I decided not to update anything i.e. put in any more hours to see how much Blockstack PBC team does in fixing the issues. The situation came out as worst. I have actually closed the project down, going to open source it and leave it there. Already told @Gina to remove it from the app mining. Here are my two cents, I guess I can be honest and don’t need to go anywhere else to complain. The main problem is of trust on the team. Trust as in your ability to run such a complex experiment with no prior experience or example, instead of you favouring a project. You can’t keep saying its a pilot run, there are big holes that are fundamentally wrong metrics. It’s not about a fancy algorithm. The game happens below the algorithm! Producthunt votes mean nothing, people don’t even download the apps before or after the vote. I gave an example about Vegan Scanner app in the slack as well. TryMyUI was a good touch, reviewers comments? Most of them said they can’t understand the product, “maybe its like for work or something”? Seriously? That’s the basis of providing a grant to a project where the user doesn’t belong to the target group, isn’t even briefed or didn’t bother reading the description of the app? Here is the scenario - I worked day and night for 5 full weeks to complete Timski in it’s current shape. Developing decentralized group chats isn’t easy, the app was for iOS, it needed to clear a certain requirements to get certified while it is pitched against Android and Desktop apps, you can literally update them with a single click at any time of the day or night. Apps like Timski can’t go and start charging people straight away without going on a full-on battle with Slack and Discord. That’s a huge undertaking, something that can’t even be thought of without initial substantial funding, you are essentially asking us to run companies, the competitors where are unicorns already! What algorithms giving away are $32 and $1.5. This also have been highlighted by several devs now that without business/consumer/media/entertainment etc categories, you can’t identify which app is better than the others. All of us are experienced developers and all of us has better things to do! Even while I am writing this, I could go and work on a better project that actually pays while I am still writing it here to make you aware of the problems, just because I liked the project. I am currently working with a layer 2 network to implement whisper/swarm and storage on smart-contracts on ethereum and I am very well aware of what you have done here technically, that’s really good work and good implementation, maybe instead of tying it a closed ecosystem, it can help and become COSMOS of the storage (more on that sometime later). You can’t go around and say it’s a pilot program and expect that devs will hang-around for 6 months or 1 year before you realize that the fundamentals are wrong and you are reluctant on even accepting them. My advise will be to go back to the drawing board and think of app-mining from the scratch again and meanwhile close this version down, you are just making devs angry and you will lose whatever apps you have currently! Meanwhile, if you want to give grants to a few flagship apps, you can actually do that easily without running app-mining. Current app-mining requires only auth. I was stupid to think of Slack etc. I should have just built an auth for the Vegan Scanner app (useless, pointless, even while allowing the users to use a skip button). 186 PH community votes, TryMyUI would love it because there is no learning curve, the app’s design is shiny! It has about 100 daily downloads, total users above 8000, so future metrics proof as well. Wouldn’t matter if DE voters never gave it any vote, PH votes and trymyui would have got better grant than Timski anyway! Just punch-in these numbers in the algorithm to know! Until unless, Blockstack PBC would actively block the app by itself but giving what reason? Then I have another 10 year old app on the Android with more than a million downloads, an auth there? Why are we even spending this much time on making new apps with decentralized storage? Anyway, I will sign-off from here now! I know everyone’s intentions are really good but please do listen to what devs are saying here, this project does not have a lot of devs and new devs aren’t coming to decentralized tech during this bear run! +1 to most of the issues pointed in this thread. I am the developer of YourNote.app and the payout we got was equal to 1 hr of my time. YourNote is a project that uses the core features of Blockstack and Gaia and many people use it too (unlike many other projects). Provided that, it’s very disheartening to see such a negative response from App Mining. 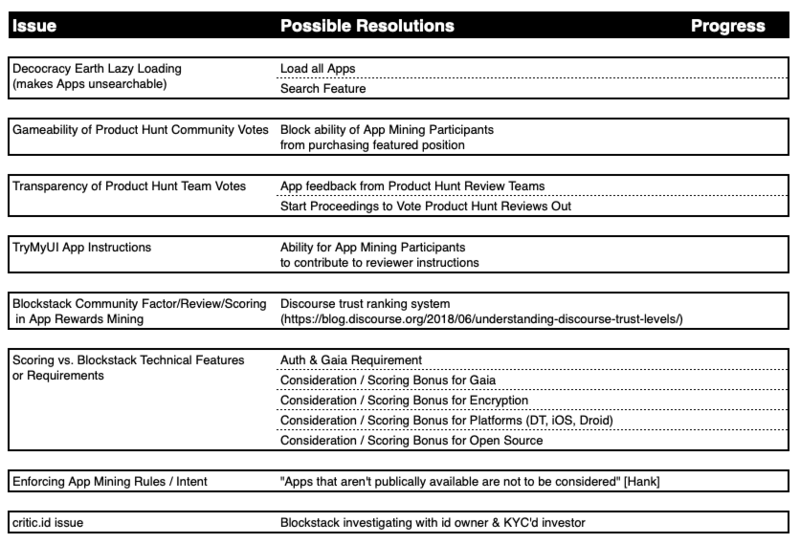 App Mining aims to promote the development of quality apps on Blockstack platform but how can we ensure the same when the promotion mechanism is so flawed and unfair. Basic apps with basic (blockstack) functionality get voted at the top and a full-fledged app is ignored. It’s very tough to continue developing it after experiencing such a response (it’s almost humiliating). I hope Blockstack fixes this soon. My point is after 1 year of self-financing I’ve now gone back to spending my time with things that earn money as I must support my family. Appreciate all the work you’ve done believing in decentralization and open-source. Startups are hard and everyone attempting them takes these risks. I personally went without a salary for years, racking up credit card bills, when attempting startups (Blockstack and one effort before it). A quick note on Casa, yes the Signature Fund is an investor, and we’re excited about the work they’re doing. The fund is relatively a very small investor though, their fundraising success is because of their own efforts and the fund’s investment, in my view, doesn’t move the needle much. In general, the VC market is fairly mature with many players in it and a startup’s fundraising success depends on how well you do in that market. There are many many factors to successful fundraising and getting into that would be off-topic here. I’m always happy to give advice and share my lessons (as I’ve done with several other teams).